Ghost World is a comic book written and illustrated by Daniel Clowes. It was originally serialized in issues #11 through #18 of Clowes's comic book series Eightball, and was first published in book form in 1997 by Fantagraphics Books. A commercial and critical success, it was very popular with teenage audiences on its initial release and developed into a cult classic. The book has been reprinted in multiple editions and was the basis for the 2001 feature film of the same name. Ghost World follows the day-to-day lives of best friends Enid Coleslaw and Rebecca Doppelmeyer, two cynical, pseudo-intellectual and intermittently witty teenage girls recently graduated from high school in the early 1990s. They spend their days wandering aimlessly around their unnamed American town, criticizing popular culture and the people they encounter while wondering what they will do for the rest of their days. As the comic progresses and Enid and Rebecca make the transition into adulthood, the two develop tensions and drift apart. 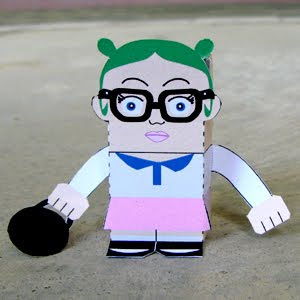 Download the PDF file here and make your own Enid toy! I don't know whether you meant this inspired choice to be a comment on the weird Facebook spamming for corporate mascots or not, but I absolutely love that you chose Enid this week.